Once installed, your home is warranted by the world's largest basement waterproofing network! CactusBoard comes with a transferrable 20-year Dry Basement Floor Warranty! Installing CactusBoard is easy - install around inside perimeter, pour floor, and done! 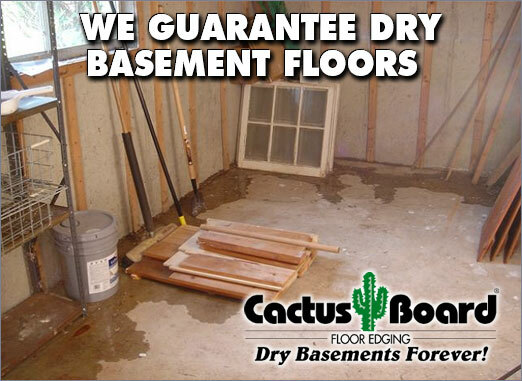 CactusBoard will give you a dry basement floor - even if you only dampproof. Market your homes with basements that are "finish-ready"
Once you hand the keys over to the homeowner, the basement doesn't cost you another dime! Calling all General Contractors! Finally… A Foundation and Perimeter Basement Drain that Works! How Do You Keep a Basement Dry? With the CactusBoard foundation waterproofing system for new homes. The solution is easy, inexpensive, and warrantied for 20 years! Wet basements are a problem. They are particularly troublesome because of the damage they can cause to a homeowner’s belongings – and the solutions can be disruptive and expensive. Should any water get inside the basement of a newly constructed building, the first person the homeowner will call is you – the home builder or general contractor. Now, there is a solution for a home builder that is easy to install, inexpensive, and warrantied for 20 years! 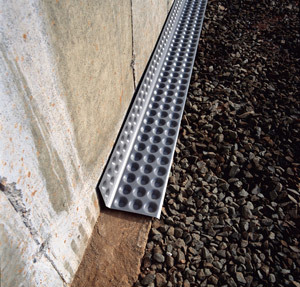 The CactusBoard is a perimeter basement footing drain and foundation wall drain system that is installed during the building of the foundation by new home builders. Not only does the CactusBoard floor edging address the water problems in newly constructed homes, it’s incredibly easy to install. It simply forms a space between the edge of the basement floor and the basement wall, and across the footing, allowing water from the perimeter and the walls to drain into the stone aggregate under the floor and then into a sump pump basin or gravity drain. CactusBoard is the only foundation waterproofing product that ensures the basement floor stays dry regardless of what happens with the basement walls or footing drains. Any basement leaks from wall cracks, form ties, window wells, pipe penetrations, as well as hydrostatic pressure (water pushing through at the footing/wall cold joint) are all addressed with the CactusBoard. With the water never touching the foundation floor – all of the homeowner’s belongings will remain safe and protected, and stop all the call backs about wet basements. CactusBoard basement drainage installation was featured in Fine Homebuilding Magazine as an integral part of creating a drainage system for a new home foundation. If you didn’t use CactusBoard on your last home, consider using it on your next – preventing even a single call-back more than pays for your time and reputation, and all with minimal investment. Nothing is more disheartening to a new homeowner than to find out that their basement leaks or gets wet. With just a few minutes of installing the CactusBoard during the foundation construction, you can guarantee dry basement floors for every new building you pour! Think about it…just twenty minutes of your efforts provides both you (general contractor) and the homeowner with a 20-year dry-floor warranty and best of all - if there’s ever a basement water problem in your clients’ home, they call us - not you! Imagine pouring a new foundation during the construction of a home or supply house and having the basement completely dry forever? Contact us today and ask one of our representatives to get started with CactusBoard.